SAN DIEGO, Calif. /California Newswire/ — MCT Trading, Inc. (MCT), a recognized industry leader in risk management providing pipeline hedging, best-execution loan sales and centralized lock desk services, is pleased to announce that MCTlive! 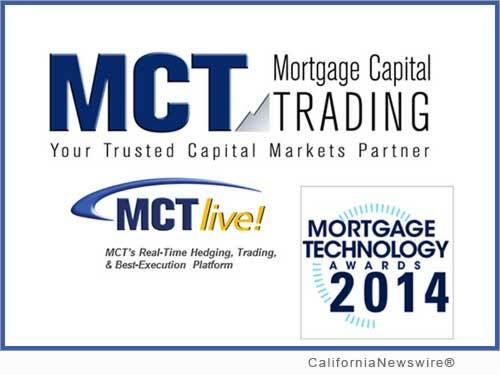 (TM), MCT's best-in-class secondary marketing software platform, has been selected as the winner of Mortgage Technology magazine's 2014 Release of the Year Award. The award was presented in Las Vegas, Nevada on October 19, 2014 at the 15th Annual Mortgage Technology Awards Ceremony. Release of the Year recognizes a new software, platform, alliance or initiative that's expected to have the broadest future impact on the mortgage industry. MCTlive! 's automation of tedious, repetitive, yet mission-critical tasks enables users to spend more time on higher value actions, relationships, and analytics that improve organizational performance. The excitement around the breadth of easy-to-use functionality and efficiency gains delivered by MCTlive! is the direct result of a multi-year collaborative development effort between the MCT software engineering team and expert secondary market managers and traders. "We developed MCTlive! to efficiently support the daily tasks, best practices, and analyses required by the secondary marketing teams of our most successful clients," stated Curtis Richins, president of MCT. "MCTlive! 's suite of tools were specifically designed, from inception, for secondary users by secondary experts. Winning the Release of the Year award is further endorsement that we have met the mark and are delivering on our customer promise of offering next generation tools that facilitate industry best practices in secondary marketing." Richins further commented: "The combination of MCTlive! coupled with our hands-on approach to client support and advisory services significantly boosts the value MCT provides to clients. We're ecstatic to be recognized alongside some of the industry's most elite mortgage technology leaders." Mortgage Technology magazine's 15th annual awards issue can be downloaded at http://www.mortgage-technology.com/ . MCT Trading (MCT) is a risk management and advisory services company providing independent analysis, training, hedging strategy and loan sale execution support to clients engaged in the secondary mortgage market. Founded in San Diego, California in May 2001, the company has expanded to include field sales and support offices in Philadelphia, Dallas, San Francisco and Charlotte. MCT is recognized leader in the industry and currently supports more than 100 clients on the HALO (Hedging And Loan sales Optimization) Program. The company also develops and supports MCTlive! (TM), an award-winning real-time, trading and best-execution secondary marketing platform. MCT's LockCentral is the industry's largest outsourced centralized lock desk service.